The Messenger of Allah (saw) said: "For everything there is a face and the face of your religion is prayers. So see to it that none from amongst you damages and disfigures the face of his religion." (Source: Biharul Anwar, Volume 82, Page 209) & "If Your Salaat is accepted then all your other deeds /Aamal are accepted"
Salat or Namaz is the most important and a complete system of worship in Islam. Literal meaning of salat is DUA. Considering salat as insignificant or taking it lightly (Istekhfaf-e-Salat) is a major sin. Both Quran and Ahadeeth emphasize that the salat must be given top priority in our daily life and must never be taken as a lightly or secondary thing. (C) Hadeeth Holy Prophet (saw) : If salat is accepted by Allah, all good deeds will be accepted, & if salat is rejected, all good deeds will be rejected. A person, who offers salat, but does not care about the masail (rules and laws) of salat, is like one who considers salat as insignificant. For some persons, the lack of knowledge of some masail of salat, wudu and ghusl, may be an acceptable excuse, but for many other persons, the lack of knowledge is no excuse, and the Islamic sharia may require such persons, in some cases, even to repeat the salat of whole life with the correct method. Hence it is necessary for every Muslim to know and understand the masail of salat carefully so that he gains full benefit of this act of worship and he is also not considered as one who is careless about salat. (C) Hadeeth Holy Prophet: If salat is accepted by Allah, all good deeds will be accepted, and if salat is rejected, all good deeds will be rejected. (D) Hadeeth 6th Imam (AS): One, who considers salat as insignificant, will not receive our shafaat. A person, who offers salat, but does not care about the masail (rules and laws) of salat, is like one who considers salat as insignificant. For some persons, the lack of knowledge of some masail of salat, wudu and ghusl, may be an acceptable excuse, but for many other persons, the lack of knowledge is no excuse, and the Islamic sharia may require such persons, in some cases, even to repeat the salat of whole life with the correct method. Hence it is necessary for every Muslim to know and understand the masail of salat carefully so that he gains full benefit of this act of worship and he is also not considered as one who is careless about salat. Mubah means lawfully obtained. The conditions of clothes, place and water (for wudu or ghusl) being mubah are extremely important because salat becomes batil (invalid) if these things are not mubah (lawfully obtained). If the income of a person is from haram sources, then the clothes, place and water obtained from such income automatically become haram and therefore salat offered using such things is batil (invalid) in most of the cases. One of the most important conditions for a thing to become mubah (lawful) is that the khums for that thing (if wajib) must have been paid. Ignoring the condition of mubah for salat is the same as taking salat lightly or insignificant (istekhfaf) and amounts to a great sin. If khums was wajib on the clothes you are wearing and has not been paid, and if the salat has been offered in such clothes, then the salat is batil (invalid) even if you did not know this rule. In such a case, you must repeat that salat with mubah clothes on. The same rule applies for the place or house where the salat is offered, and the water used for wudu or ghusl, and soil used for tayammum. If khums was wajib on other items (such as food, car, gifts etc), which are not used by the person during his/her salat, and the khums has not been paid on these items, then the salat is not batil, but the salat will not be accepted until the wajib khums on these items has been paid. Hence, it is first necessary to understand the laws of khums and halal earnings before understanding the detailed masail of salat. In Tashahhud, it is wajib to pronounce the word as "Muhammadan" and not as "Muhammadun" after the words "Ashhadu anna". In Niyyat, the correct wording is "Qurbatan ILALLAH", and not as "Qurbatan ILLALLAH". However, salat is not affected even if this wording is pronounced incorrectly as long as the niyyat in your heart is to seek nearness (qurbat) of Allah, because the niyyat in your heart is wajib and rukn in salat and actual saying of that niyyat in words is not necessary. (d) Black ladies chador (over garment). It is recommended for ladies to wear some jewellery during salat. In order to work out exact times for daily salat, it is necessary to gain knowledge of the following times: Sunset, Midnight, Dawn, Sunrise, Noon. Mujtahids differ on the definition of Midnight. Scientists differ on the definition of Dawn. For places on earth located 45 degrees above or 45 degrees below the Equator, it is very difficult to determine Dawn time. In olden days (when clocks were not invented), minarets were constructed in mosques with the purpose of going up the top of minaret and checking out the times of salat. (b) Islamic Sunset (which is 10 to 12 minutes after astronomical sunset or actual sunset) Midnight is the middle time between actual Sunset and Sunrise times, according to Ayatullah Khui. is the middle time between actual Sunset and Dawn times, according to Ayatullah Seestani, Khumaini and Khamenei. (a) Maghrib salat time starts with Islamic sunset (i.e. 10-12 minutes after actual sunset). (b) Isha salat time starts soon after offering Maghrib salat. (e) Between Midnight and Dawn, you can offer Maghrib and Isha salat with the intention of Mafiz-zimma (i.e. neither Qaza nor Ada). (f) Maghrib and Isha becomes qaza after Dawn, and it is a sin to make salat qaza. (h) Fazeelat time for Isha (with maximum sawab) starts after the Fazeelat time for Maghrib, and remains upto initial one-third part of the night. (a) Fajr salat time starts with Dawn. (b) Fajr salat becomes qaza at Sunrise. (e) Fazeelat time for Zohr (with maximum sawab) remains for 1 to 1.5 hours after Noon time according to Ayatullah Khui. (a) Fasting time starts with Dawn, and finishes with Islamic Sunset (i.e. 10-12 minutes after actual Sunset) according all Mujtahids. (b) Since it is hard to find actual Dawn, it is recommended to start fasting 10 minutes before the published earliest Fajr start time, which is generally mentioned in timetables as Imsak (when you should stop eating, drinking etc). A) Your question is general which requires a detailed reply as it would apply individually according to his incapacitated position. In short if he is unable to stand while praying, he should sit down, & if he is unable to sit, he should lie down. As long as a person is able to offer prayers standing, he should not sit down. For example, if the body of a person shakes, or moves when he stands, or he is obliged to lean on something, or to incline his body a bit, he should continue to offer prayers standing in whatever manner he can. But, if he cannot st& at all, he should sit upright, & offer prayers in that position. As long as he can sit, he should not offer prayers in a lying posture, & if he cannot sit straight, he should sit in any manner he can. & if he cannot sit at all, he should lie on his right side. If he also cannot lie on the left side then he should lie on his back with his feet facing Qibla. For example, as your question implies, a person is praying seated on a chair with a table in front of him on which is laid Mor (Sijdagah). As long as he is able to stand up he should do so & recite Takbiratul Ihram in a standing position & if he can continue standing up to recite the Qir’at he should continue to do so & perform Ruku & then sit down to perform Sajdah. If he cannot continue standing up he should sit down after reciting Takbiratul Ihram & perform Ruku in a sitting position. If he cannot stand up & recite Takbiratul Ihram then only he should recite Takbiratul Ihram in a sitting position. If he is offering prayers in a sitting position, & after reciting Hamd & Surah, he is able to stand up & perform Ruku, he should first stand up, & then perform Ruku. But if he cannot do so, he should perform Ruku while sitting. If a person cannot bow down for Ruku properly, he should lean on something & perform Ruku. & if he cannot perform Ruku even after he has leaned, he should bow down to the maximum extent he can, so that it could be customarily recognized as a Ruku. & if he cannot bend at all, he should make a sign for Ruku with his head. If a person is supposed to make a sign with his head for Ruku is unable to do so, he should close his eyes with the niyyat of Ruku, & then recite Zikr. & for rising from Ruku, he should open his eyes. & if he is unable to do even that, he should, as a precaution, make a niyyat of Ruku in his mind, & then make a sign of Ruku with his hands & recite Zikr. If a person cannot perform Ruku while standing, but can bend for it while sitting, he should offer prayers standing & should make a sign with his head for Ruku. & the recommended precaution is that he should offer another prayer in which he would sit down at the time of Ruku, & bow down for it. If a person cannot find something high on which he may place the mohr, or any other allowable thing, & if he cannot find any person who would raise the mohr etc. for him, then as precaution, he should raise it with his h& & do Sajdah on it. If a person cannot perform Sajdah at all, he should make a sign for it with his head, & if he cannot do even that, he should make a sign with his eyes. & if he cannot make a sign even with his eyes he should, on the basis of obligatory precaution, make a sign for Sajdah with his hands etc. & should make a niyyat for Sajdah in his mind, & recite the obligatory Zikr. Paper # 25Q] Please, advise me the doubts in prayers which make the prayers void & there is no remedy for them? 1] Doubts about the number of Rak'ats occurring in obligatory prayers which consist of 2 Rak'ats, like, Fajr prayers, or prayers offered by a traveler. 2] Doubts about the number of Rak'ats occurring in prayers consisting of 3 Rak'ats, that is, Maghrib prayers. 3] Doubt occurring in prayers of 4 Rak'ats as to whether one has performed one Rak'at or more. 4] Doubt in prayers of 4 Rak'ats before going to the second Sajdah, as to whether he has performed 2 Rak'ats or more. 5] Doubts between 2 & 5 Rak'ats or between 2 & more than 5 Rak'ats. 6] Doubts between 3 & 6 Rak'ats or between 3 & more than 6 Rak'ats. 7] Doubt between 4 & 6 Rak’ats or between 4 & more than 6 Rak’ats. If a person has one of those doubts which makes prayers void, it is better for him to break the prayers if the doubt persists. In fact, he should prolong thinking about it so that the form of namaz changes, or till he loses all hope to ascertain the situation. Paper # 29Q. Please, advise me what are the things (or actions) while praying which would render the Namaz Makrooh? A. 1166. It is Makrooh that a person in Namaz slightly turns his face towards right or left, an angle which would not be construed as deviation from Qibla, otherwise Namaz will be void. It is also Makrooh during prayers to shut the eyes or turn towards right or left, & to play with one's beard & hands, & to cross the fingers of one h& into those of another, & to spit. It is also Makrooh to look at the writing of the holy Qur'an, or some other books or a ring. It is also Makrooh to become silent while reciting Surah al-Hamd, or any other Surah, or Zikr, so as to listen to some conversation. & in fact, every such act which disturbs attention & humility is Makrooh. 1167. It is Makrooh for a person to offer prayers when he is feeling drowsy, or when he restrains his urge for urinating or defecation. Similarly, it is Makrooh to offer prayers with tight socks which press the feet. There are other things also which are Makrooh in namaz. They are mentioned in detailed books on the subject. Paper # 50PRAYERS Q] Kindly explain to me what does silently mean when the Mas’ala says that it is obligatory for a man & a woman to recite Sura al-Hamd & the other Surah SILENTLY in Dhuhr & Asr prayers & also what is the extent of the voice that should be raised or lowered by a man in the Fajr, Maghrib & Ishaa prayers? A] In Salaatul Fajr, Maghrib & Ishaa (JAHR), when reciting the two Surahs, a man is required to raise his voice to the extent that the person next to him can hear what is being recited, as in an ordinary conversation between two persons, while in the third Rak’ah of Salaatul Maghrib & the third & fourth Rak’ah of Salaatul Ishaa & all four Rak’ah of Salatul Dhuhr & Asr (IKHFAAT) the person should hear oneself what is being recited. [For women, all their prayers are performed as IKHFAAT]. Q] Is it recommended or obligatory for a man to recite Surah al-Hamd & the other Surah loudly while offering Fajr, Maghrib & Isha prayers. A] It is Wajib, but he should not raise his voice unusually high, as if he were shouting, & if he does so his prayers will be void. Q] Can a person take wages for teaching a person the act of prayers? A] To take wages for teaching obligatory acts of prayers is Haraam, as a precaution, & taking wages for teaching Mustahab things is permissible. Q] As a result of expansion, some cities which used to comprise a number of townships, have become very big ones. Do you consider such cities as one (physically) or the old demarcations between its different neighborhoods should be observed? Say, you set out on a journey heading to some other destination, from the easternmost point. The time for prayer was due, while you were still within its boundaries, that is in the westernmost point. Do you perform your prayer tamam (in its entirety) or qasr (shortened form). Also, when you return to such a big city & the time for prayer was due, while you were in its outskirts, do you say your prayer qasr or tamam? & what is the ruling on fasting in such a situation? A] As explained in the question, such a city is considered one, i.e. the rule of different towns is not applicable. Of course, the yardstick in calculating the distance is the definition of Musafir (traveler). If such a city is very big & it fulfils the definition, when the person embarks on his journey from his neighborhood, though it be inside the city, the rule of Musafir applies here. Thus, the distance is calculated from the approaches of the neighborhood of the Mukallaf. If the definition does not apply unless he gets out of the city, the end of the city should be the start of calculating the distance from the edge of tarakkhus (the point at the parameter of a town, when, for instance, Adhan “call of prayer” can be heard). PRAYERS OF A TRAVELLER If a traveler who wants to stay at a place for ten days, has determined at the very outset, that during the period of ten days, he will travel to surrounding places up to the limit of Tarakhkhus or more, & if the period of his going & returning is so brief, that it cannot be considered as infringement of his intention of staying there for 10 days, he should offer full prayers. But if it is considered as an infringement, then he should pray Qasr. For example, if he is away from that place for a day & a night, then that prolonged period will be breaking the intention, & he will pray Qasr. But if he was away for, say, half a day, returning by the evening, it will not be considered as breaking the intention. Of course, if he travels frequently from that place, giving an impression that he is visiting two or more places, then he will pray Qasr. Question put forward to Maulana Sayyid Muhammad Rizvi based on the above Ruling. Will the same Mas'ala be applicable, under the same situation, if a traveler who has decided to stay at a place for more than ten days, did not determine at the very outset, but travels to a nearby place of more than 28 miles (return) & returns the same day. For example, he travels in the morning & returns the same evening or he travels in the afternoon & returns at night. As I understand, he will be required to pray Qasr during his traveling but will continue to pray full on his return of stay at a place where he had decided to stay for more than ten days. Answer given by Sayyid Muhammad Rizvi. By looking at the ruling, yes, if a person did not have that intention from the very beginning & changes his plan in between, then for the remainder of his stay, he will have to pray Qasr unless the remainder days are 10 days. If a traveler, who wants to stay at a place for ten days, has determined at the very outset that, during the period of ten days, he will go to different sides of that place up to the limit of Tarakhkhus or more, & if the period of his going & return is, for example, about one or two hours which is not usually inconsistent with ten days' stay, he should offer complete prayers. & if the period is more than that, he should, as a precautionary measure, offer shortened as well as complete prayers, & it that period is full day or the larger part of it, he should offer shortened prayers. Q.] If a person prays wearing dress which has been purchased with the money whose Khums has not been paid, is his prayers valid? A.] If a person purchases a dress with the particular sum of money whose Khums has not been paid by him, then Namaz in that dress will amount to the Namaz in a dress which has been usurped. Q] Is the validity of Namaz adversely affected if a person prays wearing a Najis pair of socks or cap? A] If small dresses belonging to a person offering prayers, like his socks or scalp cap, which would not ordinarily cover his private parts, become Najis, & if they are not made of the parts of a carcass or an animal whose meat is Haraam to eat, the prayers offered with them will be in order. & there is also no objection if one offers prayers with a Najis ring. Q) If a person prays with a Najis dress because of forgetfulness, is his/her prayer valid? A) If a person forgets that his body or dress is Najis, and remembers during Namaz, or after completing Namaz, as an obligatory precaution, he should offer the prayers again, if his/her forgetting was due to carelessness. And if the time has lapsed, he should give its Qadha. If he has ample time at his disposal while offering prayers and he realizes during the prayers that his clothes are Najis, and he suspect that they may have been Najis before he started the prayers, he should wash it, or take it off (and in the case of body he should wash that Najasat off his body), provided that in so doing, his prayers does not become invalidated and continue his Namaz to its completion. But if he has no other dress to cover his private parts, or washing the dress or taking it off, or washing that Najasat off his body, may invalidate his Namaz, he should, as an obligatory precaution, repeat his Namaz with Pak clothes. In the event the time at his disposal is short, under the same circumstances explained above, he should complete his Namaz in the same state, and his Namaz will be valid. Follow up Question. What is he required to do if he only doubts whether his body or dress is Pak? A) If he doubts whether his body or dress is Pak, and if he did not find anything Najis after investigation, and prayed, his Namaz will be valid even if he learns after Namaz that his body or dress was actually Najis. But if he did not care to investigate, then as an obligatory precaution, he will repeat the prayers. If the time has lapsed, he will give its qadha. Follow up Question. What is the status of his prayers if person washes his dress, and becomes sure that it has become Pak, and offers his prayers with it, but learns after the prayers that it had not become Pak? A) His prayers are in order. Q] Can a person in Namaz carry (not wearing) Najis things with him? The time between the special times of zohr and asr is the common time of these 2 namaz. But, during this time too, zohr will be recited first, followed by asr. Similarly the time between the special times of maghrib and isha is the common time of maghri-isha. In this time, too, maghrib will be recited first followed by isha. 1.} when you are sure that the time of namaz has set in. eg, you yourself have decided the time by seeing the sky, sun, etc. nowadays there is too much light in cities and even in some villages which makes it very difficult to find out the time of subah kaazib, subah saadiq and maghrib. 2.} from clocks and reliable namaz timing charts. Such charts are available for all cities. If someone has not recited zohr and the special time of asr sets in, first recite asr in its special time with the niyyat of ada, then recite zohr with niyyat of qaza. Similarly if someone has not recited maghrib and the special time of isha sets in, first recite isha with niyyat of ada, then recite maghrib without niyyat of ada or qaza. Satar means to cover. In islam details of every act and ibadah have been taught. This includes those of satar. It is wajib for every man and woman to cover his/her private parts (place of urination and passing stools) from other people and children who can understand. In addition, it is wajib for a woman to hide her entire body, hair of the head and beautification/decoration from na mehram men. Exposing the face and the hands upto the wrist is allowed with some conditions. In certain circumstances it is necessary to cover even these parts. Mehram: are the close relations of men and women between whom shariat has not demanded covering up eg son-mother, aunt-nephew, grandfather and granddaughter, brother-sister etc are mehram for each other. v Na-mehram: Besides the mehram, all men and women are na mehram of each other, even if they are close relatives eg first cousins, brother in law-sister in law etc. Shariat demands covering up between namehram. For men: in namaz a man is expected to cover up at least both his private parts, whether there is an onlooker or not. It is better to cover from the navel to the thighs. For women: It is wajib for a woman to cover the entire body including the hair on the head. It is ehtiyat and sawab to cover the soles of the feet as well. Qibla means a place to turn to. Allah has declared the ka’ba , qibla for muslims. 3.} in the grave , the dead body should be turned towards the qibla. 4.} During Zabeeha the animal should be turned towards the qibla. 1.} dress should be paak. 4.} it should not be made of any part of a Haraam flesh animal. 5.} dress of a male should not be of pure silk. 3.} dress should not be made of any part of a murdaar. 6.} fress of males should not have been woven/embroidered with gold. In normal conditions namaz in a najis dress is not jaez. The dress of the namazi should not be gasbi(usurped). The dress should either belong to him or he should have the permission of the owner to use it. Eg dress made of skin of a murdaar goat is najis and the namaz recied wearing it will be batil. Eg: namaz recited while wearing dress made of skin of cat, fox, rabbit etc is batil. Namaz in a dress made of a mix of soot and silk is correct, but makrooh. (check this). Women are allowed to recite namaz wearing dess made of silk. For a man reciting namaz in a dress with gold thread is batil. women are permitted to wear such a dress for namaz. Rule : even besides namaz, it is haramfor men to wear clothes of pure silk/ with gold. 4.} a dress/ ring with picture of a face . 7.} place should be nearly leveled. The place of namaz should not be gasbi. The place should either belong to you, or you should have the permission of the owner to use it. If you are compelled to recite namaz in a moving vehicle, plane or boat, as far as possible do not recite any zikr during jolting. There should be ehtemal ( a low chance) that the recite will be able to finish the namaz there. Hence avoid reciting namaz in crowds or where the sun, water etc will interfere with the namaz. There should be enough space to do the qayam, ruku, sajda properly. Besides the place of sajda, if the place of namaz is najs ,it should not be so wet that it will make the body or clothes of the reciter najis. But if the place of resting the forehead in sajda is dry, but najis, still the namaz is batil. If men and women are reciting namaz in one place eg in a room, then the woman should either stand more than 10 handspans in front of him, or (on basis of ehtiyate wajib) she should stand so much behind him that the place on the floor her forehead touches in sajda should not be beyond the place where the man puts his knees on the floor for sajda. Note that such situations can often arise in homes when brother-sister, husband –wife, recite namaz at the same time. Rules for man & woman reciting salat together, even if they are mahram for each other. 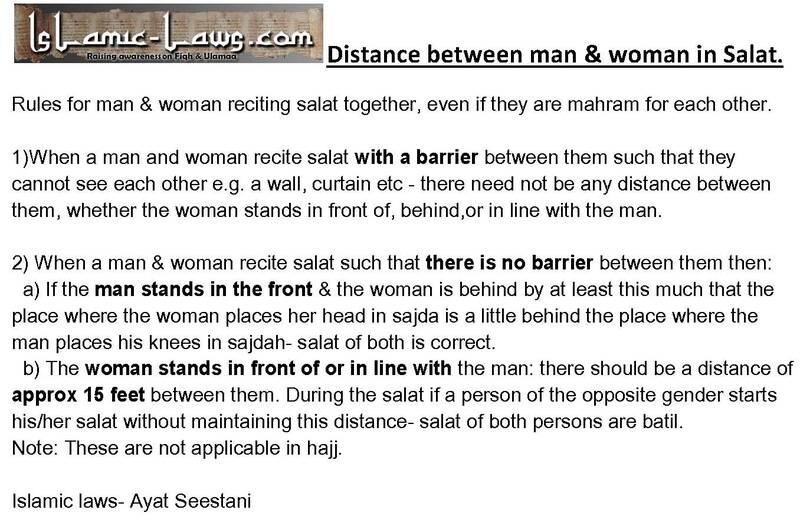 1)When a man and woman recite salat with a barrier between them such that they cannot see each other e.g. a wall, curtain etc - there need not be any distance between them, whether the woman stands in front of, behind,or in line with the man. a) If the man stands in the front & the woman is behind by at least this much that the place where the woman places her head in sajda is a little behind the place where the man places his knees in sajdah- salat of both is correct. b) The woman stands in front of or in line with the man: there should be a distance of approx 15 feet between them. During the salat if a person of the opposite gender starts his/her salat without maintaining this distance- salat of both persons are batil. Note: These are not applicable in hajj. the difference in the height or the slope of the place of standing and doing sajda should not be less or more than 4 joined fingers. Shariyat has stressed a lot that namz should be recited in masajids. The best amongst the masajids is masjidul haram. After this in order come masjidun nabawi,masjid e koofa, masjid e baytul muqaddas, the central masjid of every city, masjid of the locality, masjid of the bazaar. Things which must be said & done in namaz are called wajibate namaz. These are the wajibaat which when not done purposely will make namaz batil. naaz is still correct of you omit these by mistake. But in this case you have to follow the specific rules ..?
. Magar is surat may jo okum diye gaye hai in par amal karna hoga.